You'll be £8.00 closer to your next £10.00 credit when you purchase They Gave Me A Seafire. What's this? A classic in every sense of the word, the re-issuing of this book is sure to provoke an enthusiastic response. First published in 1986 by Airlife, its publishing history has seen a great number of glowing reviews generated, coming from both historians and participants in the proceedings that the author so eloquently relays. The book charts Crosley's service career in the Fleet Air Arm during the entire period of the Second World War. Part of his service saw him in action aboard HMS Eagle, flying Sea Hurricanes on the Harpoon and Pedestal Malta convoys of June and August 1942. It was during this time that he shot down his first enemy aircraft and survived the dramatic sinking of HMS Eagle. From there he graduated on to Seafires, (the Naval equivalent of the Spitfire), and flew this type in Combat Air Patrols over Norway and ramrod strikes from Operation Torch (the invasion of French North Africa in November 1942), through to D-Day in June 1944 in the European Theatre of Operations, and then in the Pacific abroad HMS Implacable as part of the British Pacific Fleet in 1945 until the end of the Pacific War, by which time he had command of his own combined squadron, 801 and 880. The narrative is well written in a frank and often scathingly critical way of Fleet Air Arm operations during the Second World War and beyond. The book looks set to bring the endeavours of Crosley to a whole new generation of enthusiasts, and it should appeal across the board to fans of aviation, naval history and families and friends of Armed Forces, past and present. If any naval aviator, or anyone interested, wants to read a witty, perceptive, colourful, comprehensive hostory of the twentieth century Fleet Air Arm from Inskip to the Phantom F4, from biplanes to heavyweight fast jets, then here it is. Complete with a fascinating personal postscript added by his wife, Joan with extracts from a good selection of his letters, illustrating various facets of his character. The book is nicely illustrated with a very good selection of photographs. Overall it is well produced by Seaforth and strongly recommended. Well-written in a readable style. 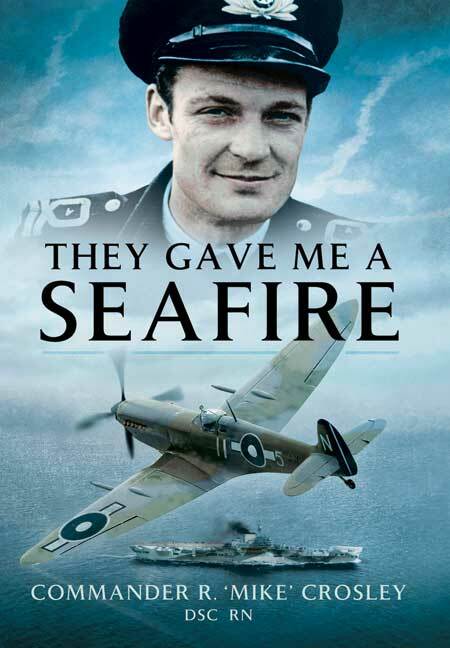 'They Gave Me a Seafire' charts the service career of Commander R. Mike Crosley, who fought not only in the Second World War, but also in the Korean War, and was a test pilot for the Royal Navy for 20 years. The fascinating publication details Mike's incredible capacity for survival, and sheer skill as a pilot, which were remarked on at the time, securing him a number of decorations. The book looks set to bring the endeavours of Commander Crosley to a whole new generation of enthusiasts, and it should appeal across the board to fans of aviation, naval history and families and friends of Armed Forces, past and present. As seen in the Isle of Wight County Press. Overall a very good read and a must for anyone who wants to know what it was really like to take to their air during the war. This is a very valuable account by a Fleet Air Arm pilot who served through WWII and it is also a remarkably rare account. Highly recommended. If you have not already read this superb book, this is the perfect opportunity to right a wrong. If you have read it, introduce a friend or younger type who has not yet had the pleasure! It remains one of the most honest, candid and truly delightful memoirs I have read. This new edition, with the postscript, is the perfect memorial to one of the Fleet Air Arm's greats.